I made this image as a Christmas present for artist and activist Phil Yeh, who created and owns the Winged Tiger and Patrick Rabbit characters pictured, and reserves all rights to them. Phil’s work is about promoting literacy and creativity, and I used this project to pull myself out of a creative slump. It seemed a poetic fit. If you haven’t read Winged Tiger Comics & Stories, the scene depicted might not make a lot of sense to you. 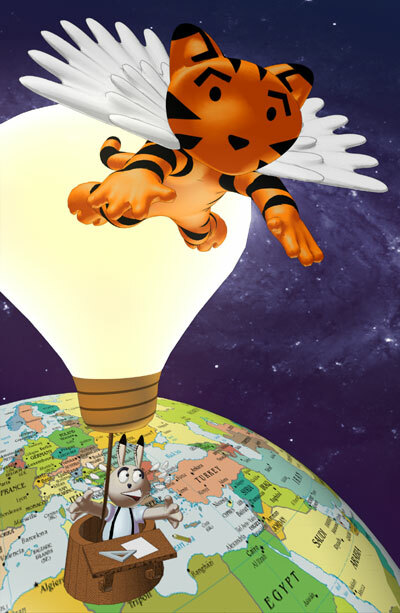 Patrick Rabbit is a cartoonist with writers block, and the Winged Tiger is using its magic to drag Patrick all over the universe to ask artists where they get their ideas. Wherever possible, the answers come from Phil personally interviewing those artists, and the comic’s artwork incorporates sketches that they give him. It’s an inspiring community effort, as well as a technically daunting collaboration. To read more about or purchase Phil’s books, visit wingedtiger.com.